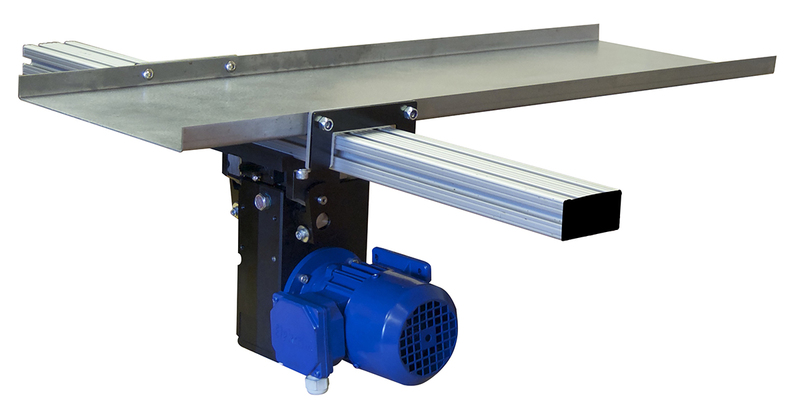 The EMCS offers manufacturers a metal stamping conveying system with a compact design that is driven by an electric precision gear motor. Unlike pneumatic scrap shakers which require lubrication and filtered air, the EMCS scrap shaker eliminates the need for both. Maintenance and electricity costs are minimal. Linear guides at each end of the cross bar to resist off center loading. Electrically Powered means no air conception and no air regulator to damage. Seals and systems components require no lubrication. A Precision Gear Box converts rotary motion to specific reciprocating motion. Gears run in oil for longevity, fixed speed optimizes tray motion and gear reduction creates high load capacity from a small force. Shaft Driven Configuration transmits motion and force where needed. Eight to 196-inch bolster lengths are available. Small Footprint has a total depth of as shallow as 8 inches. Operators have easy access to dies while mounts on either side of the press can be configured to remove scrap in either direction.